Choose abundant life, says the Lord. Yes, you have a choice. 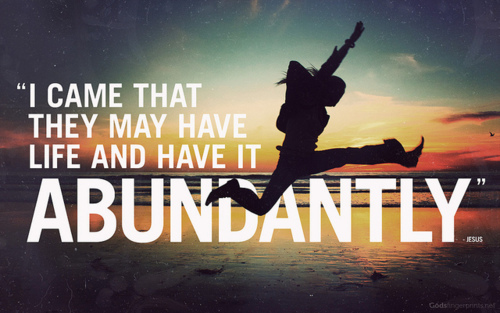 I Am about abundance. I Am about life. It is in the tongue of the wise to speak life and speak abundance. For your focus needs to be on ME and what I am speaking and what I AM doing and what I Am authoring, and what I AM giving onto you. Let My thoughts and ways and Word be released from your lips rather than repeating the negative verbiage around you. Speak life and light and there will be life and light. Speak provision and there will be provision. Speak healing and health and there will be healing and health, says the Lord. Put voice to your faith and put voice to MY WILL. For I will supply your needs abundantly as you release your faith and trust in ME, says the Lord. Nothing is off the table. As you come into My presence, you do not have to leave with a portion that will merely sustain you in these times. I want you to have much more so that you will not only have enough, but you will be a blessing to others, says the Lord. Remember when I blessed the loaves and fishes, not just so that there would be enough to get by, but abundance. Not only did I meet all the need, but there was more left over than what they had to start with. This is My miracle power for you today. I want you to have more than you started with, says the Lord. You must believe. Speak faith that comes from the very depth of your being and watch Me not only supply your need and the need of those around you, but I will give an abundant supply so that your ministry will be from the overflow of My blessings upon you. Arise and proclaim that your God is almighty and able and a can do and will do God. I will give life and there will be an abundant supply if you will boldly proclaim that My supply for you is inexhaustible, My goodness and mercy for you is everlasting, and I will not forsake My own or leave them to their own devices. I will prosper you and give you good health if you entrust your care for Me and BELIEVE that I am your God that will provision you continually regardless of the times and the seasons, says the Lord.